The streets of London glow when the sun shines. 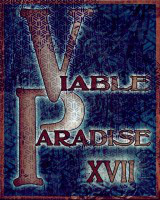 It is a city that radiates its history, and it is a city that is best experienced afoot. Therefore some of my favourite moments have been simply walking, passing through an architecture that exists nowhere else to world. Whenever I can, I walk home from my office in central London (Holborn) to my flat in north London (Kentish Town). Both of these neighbourhoods exist in the sprawling borough of Camden that stretches from Holborn all the way up past the rolling hills of Hampstead Heath. It’s a two-mile walk that gives me time and mental space to displace the labours of the day. You can trace my route with me at this link. 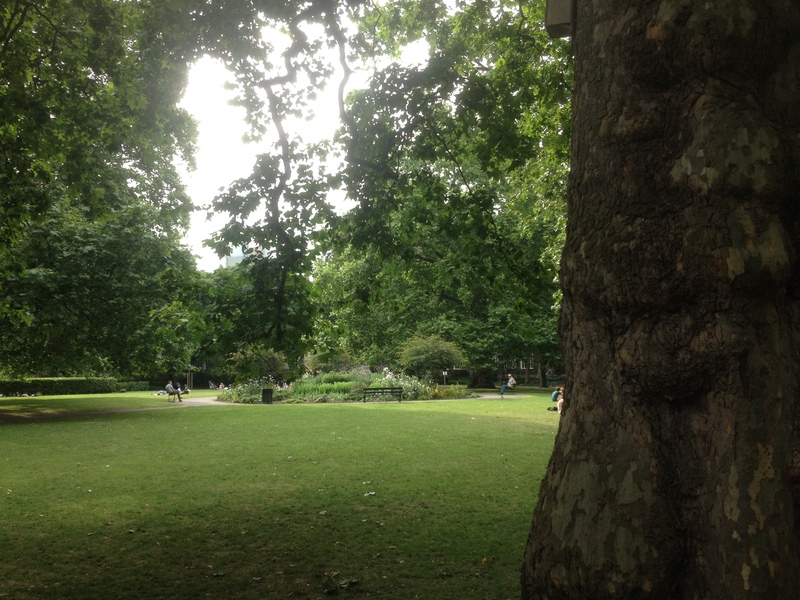 My office is in the heart of Holborn, next to the City Law School and Gray’s Inn Gardens. It’s a neighbourhood of classic three and four-story brick office buildings with a charming character of mid-20th century London. It’s just a few short blocks to the British Museum, which makes for an amazing lunchtime outing. 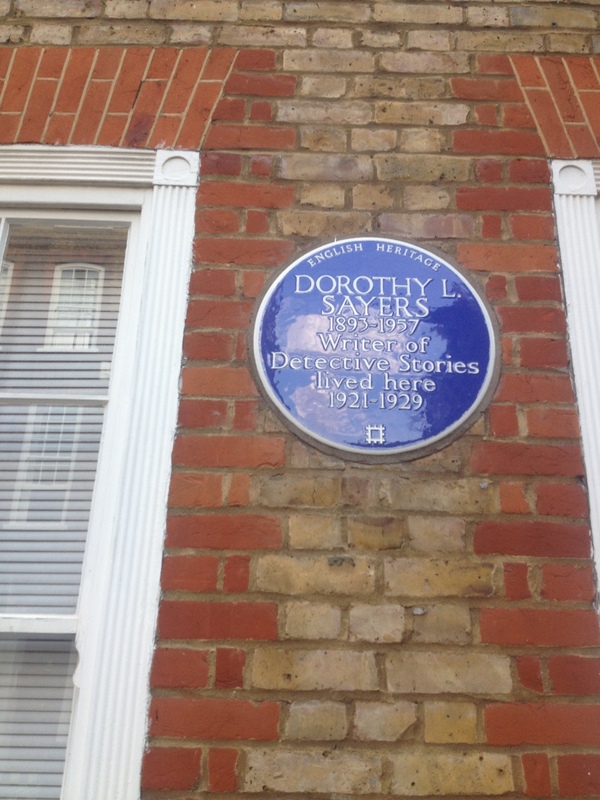 Almost immediately, my route takes me past the one-time home of early 20th century mystery novelist Dorothy L. Sayers. Finding these felt to me like discovering a little secret. 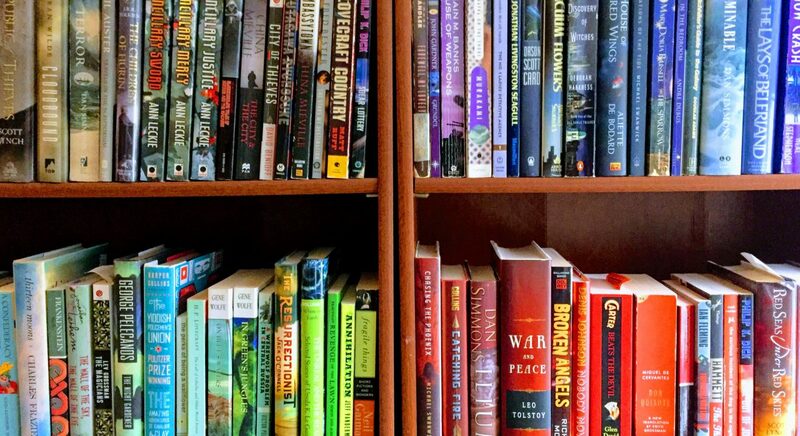 An intrepid explorer can find these literary and historical secrets in almost every corner of London. Speaking of which, one street over, on Doughty Street, is the Charles Dickens Museum, where the author lived when he wrote many of his famous novels, including Oliver Twist. I turn the corner at the Rugby Tavern, a traditional pub so named because it was built in 1850 on land donated by the Rugby School. I confess I’ve not yet stopped here for a pint, though I have been tempted! 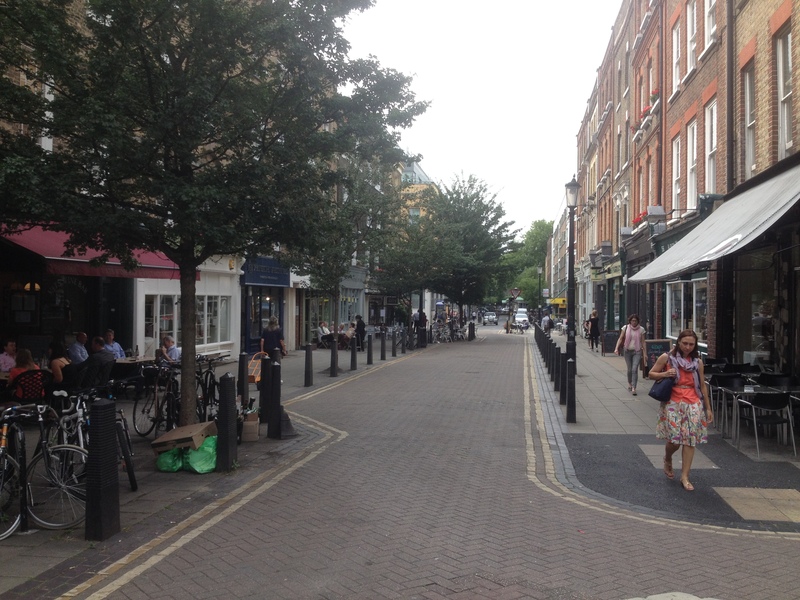 My detour takes me into the neighbourhood of Bloomsbury, via Lamb’s Conduit Street, which is a narrow street of charming high-end tailors, interior designers, publishers, and wine importers. I pass the Great Ormond Street Hospital and the Institute of Child Health as I jog briefly onto Guilford Street before passing into Brunswick Square Gardens. It’s a lovely little 18th century square ringed by trees. In the middle is an enormous London plane tree. My route jags onto Hunter Street and the Renoir Cinema before Hunter turns into Judd Street on it’s approach to St. Pancras International. There are a number of galleries, pubs, and cafes along Judd Street, but my favourite feature is simply the rows of red brick offices with white windows and eaves. It’s almost as if, I don’t know, people who live and work there cared what their buildings looked like! Where Judd Street intersects Euston Road and becomes Midland Road, it is flanked by St. Pancras rail station on the right and the British Library on the left. This view is breathtaking every time I see it. 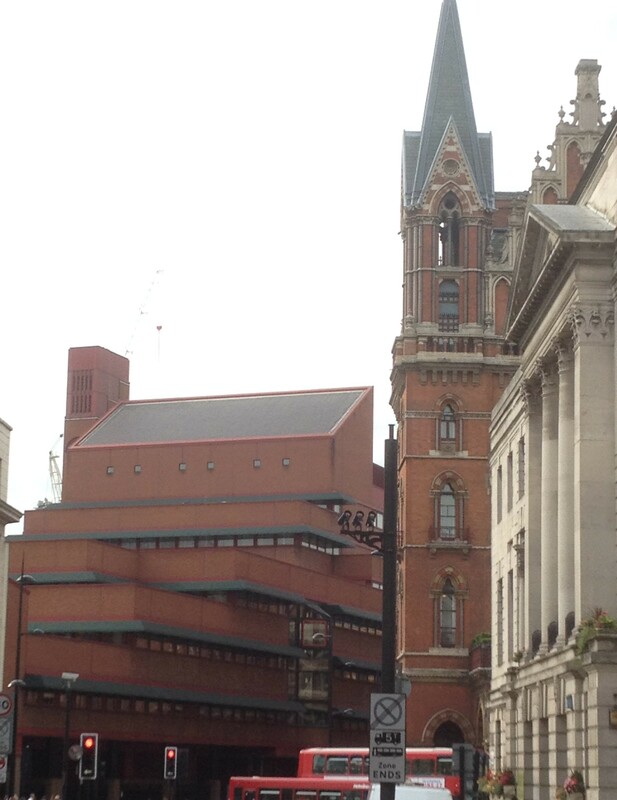 The British Library is very modern while St. Pancras is a classic of Victorian Gothic architecture. The corner of St. Pancras is dominated by the elegant St. Pancras Renaissance Hotel of London, formerly the Midland Grand Hotel, which I imagine looks as gorgeous on the inside as it does on the outside. 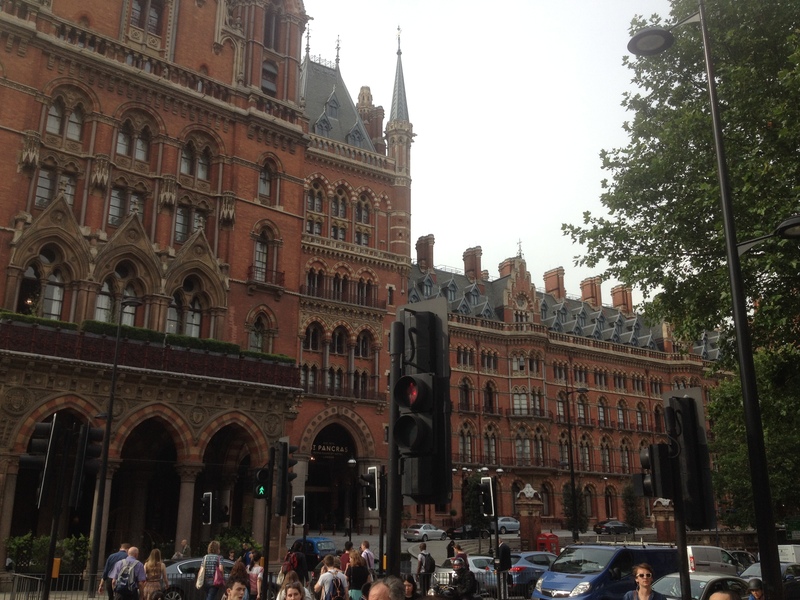 From St. Pancras (built in 1868) and its sister station next door, King’s Cross, you can travel not only anywhere in the UK, but you can take the Eurostar to Brussels, Paris, or Eurodisney. Auto traffic is busier here with so many people traveling to the train stations, and the sidewalks are packed. The noise of cars, buses, scooters, and the voices of dozens of different language merge into a stew of noise that can be overwhelming or exciting, depending on my mood. Headphones are a safe bet! I walk alongside the British Library, where you can see the Magna Carta (don’t worry, turns out there are lots of copies), the earliest known written version of Beowulf, original scores by Mozart and Beethoven, or an exhibition on indie comics in the UK. At Brill Place, I break away from the rumble of taxis and buses for the momentary tranquillity of a small park. 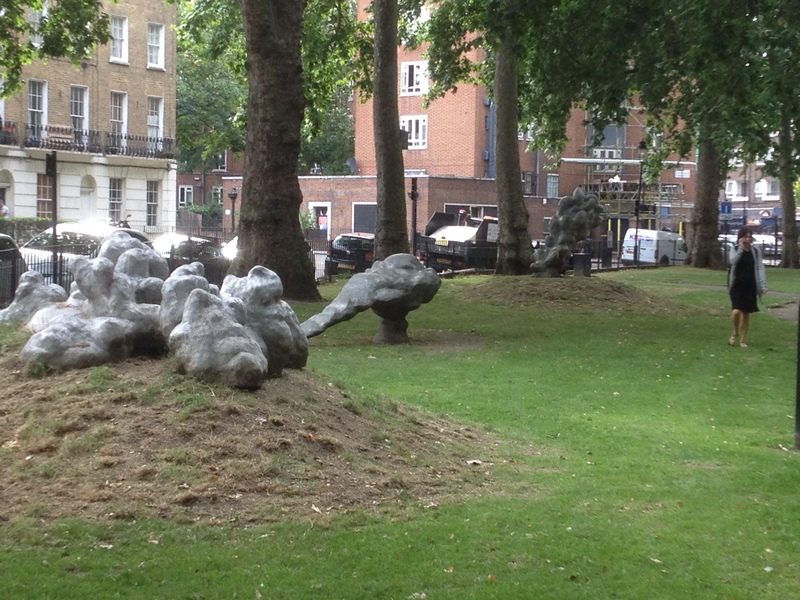 Opposite the park, Purchese Street takes me to the tiny green space of Goldington Crescent, filled with strange public sculptures that inevitably make me think of volcanic ejections. Across the street is St. Pancras Gardens and St. Pancras Old Church, which has been a Christian place of worship for ages, possibly as far back as the Roman era, 314 AD. Old Church indeed! Cyclists race past me as I hike up Royal College Street, the Royal Veterinary College on my right. I cross over the canal that runs through Camden and then pass beneath the rattling of the London Overground. 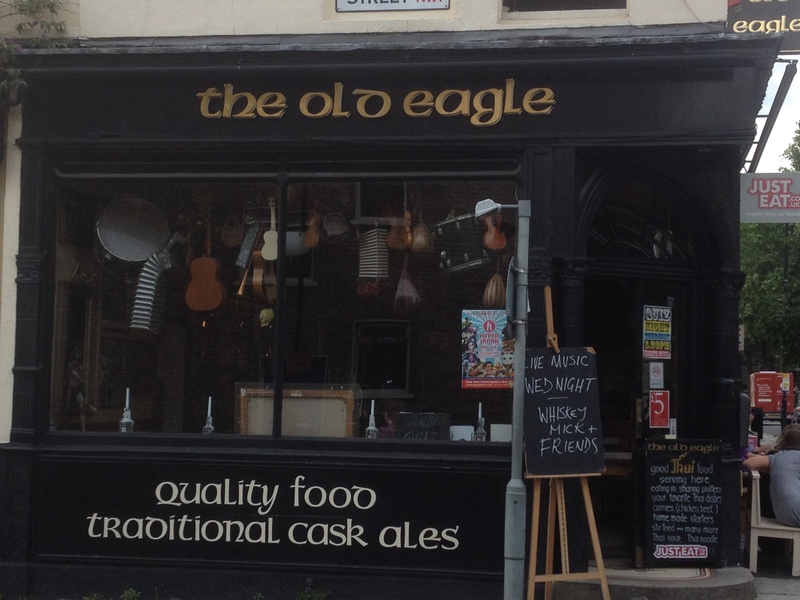 On my left is one of my very favourite pubs, The Old Eagle, which is filled with strange knickknacks. Old harps, drums, guitars, and other instruments hang in the windows and the smell of Thai food tumbles out of the open doors. I briefly merge onto the bustle and hubbub of Kentish Town Road, packed with greengrocers, coffee shops, pubs, and kebab houses in the few hundred meters before I turn onto Prince of Wales Road. I’m almost home. On Prince of Wales, I pass the Grafton, where Reggae Choir gathered in May and June. They’re currently serving barbecue, and for London, it doesn’t disappoint. Next up is the Kentish Town West Overground Station, the Fields Beneath coffee shop, and down the alley to what may be my favourite hang-out in all of London, Camden Brewery. 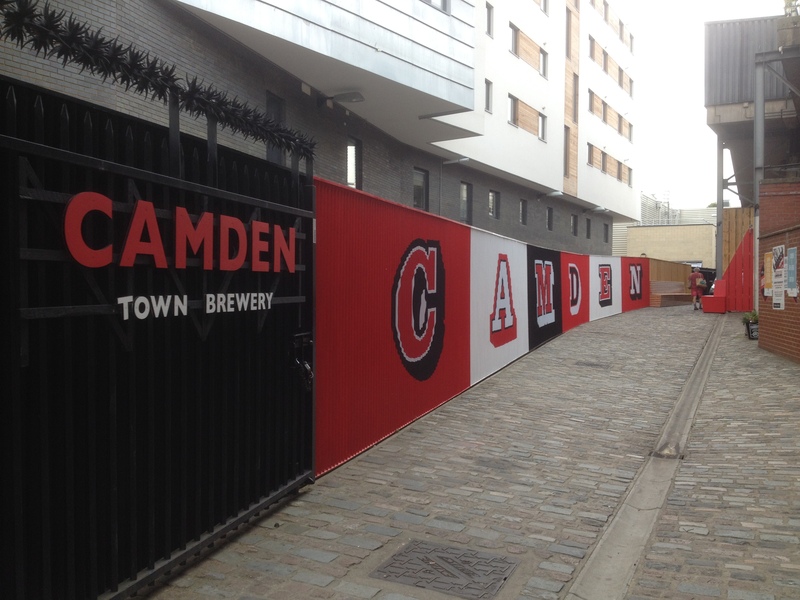 The brewery is probably closed unless it’s Thursday or Friday, but they’ve been putting up fences and painting them with their vintage-looking Camden Town logo, and I’m already looking forward to a pint. 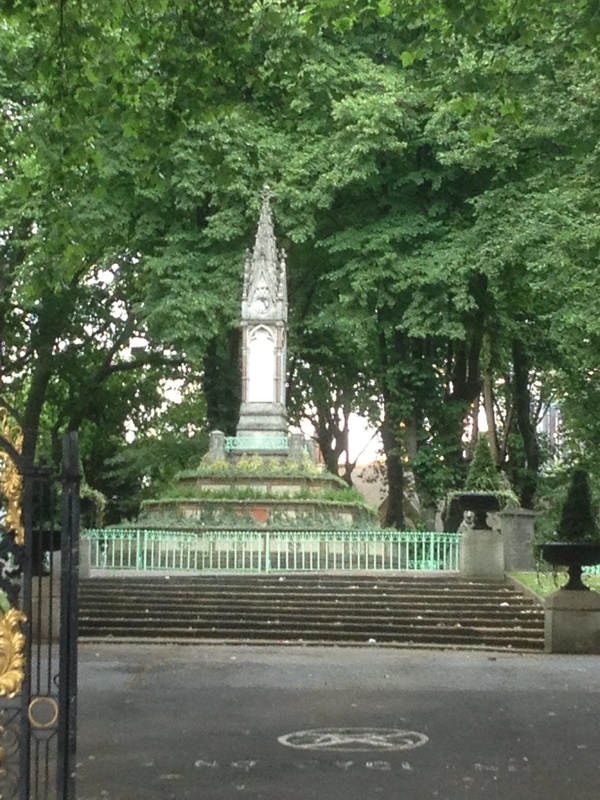 I hike across Talacre Gardens, the small public green across the street from my flat. 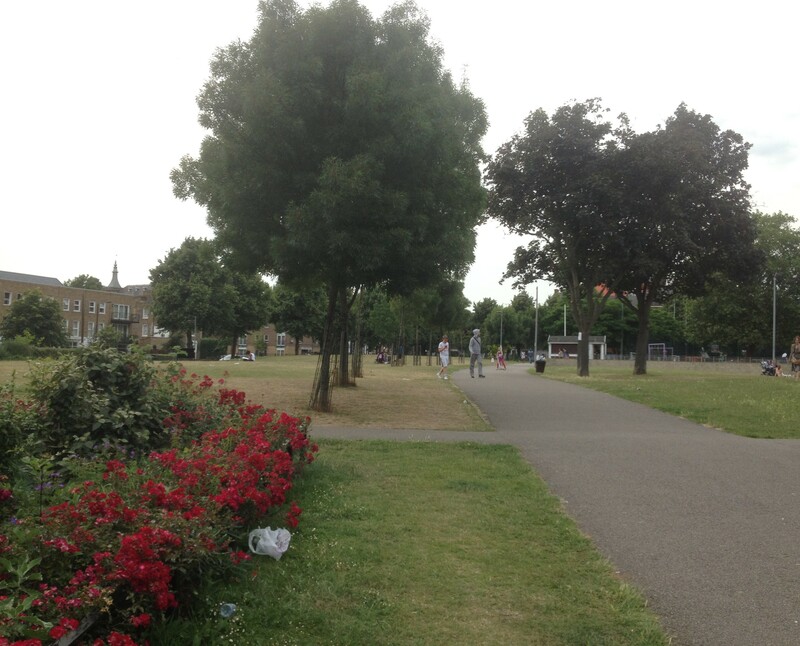 It’s filled with dogs chasing tennis balls and kids bobbing around the small playground. Young couples sprawl on the grass with bottles of wine and paperback books. I will soon join them. 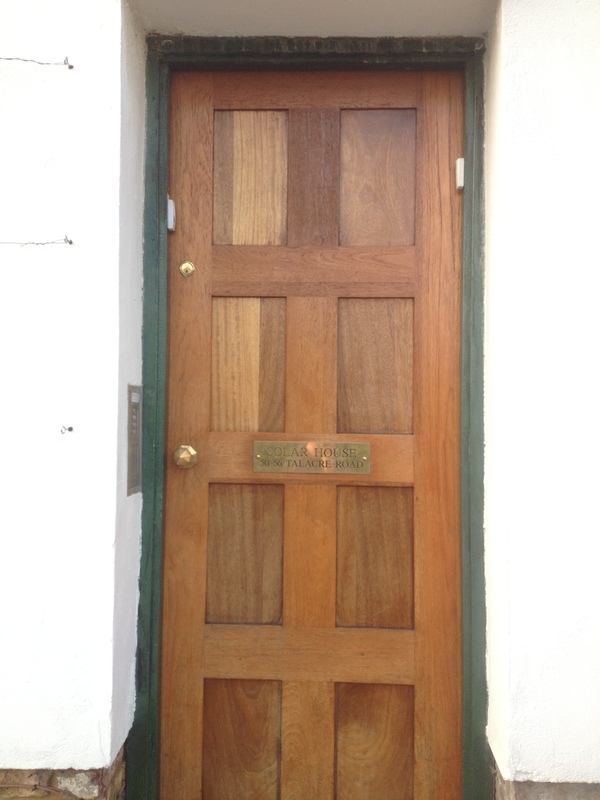 Finally I come to the antique wooden door, the courtyard, and the door to my own flat. I am home!